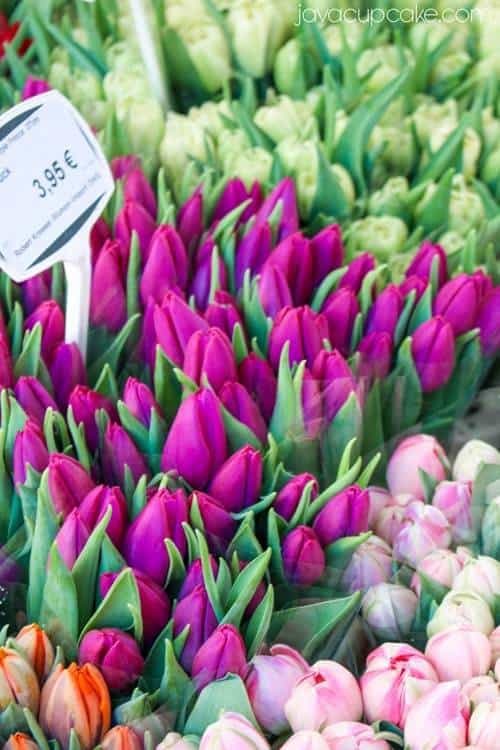 Every Spring, cities and towns both big and small in Germany celebrate the Easter season with a festive market. 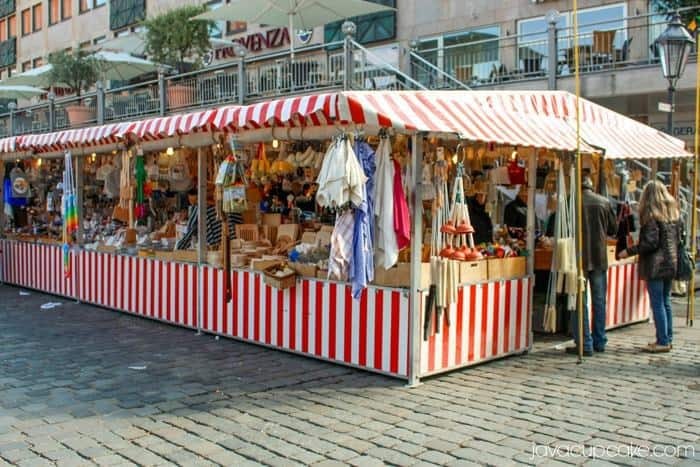 The Ostermarkt (Easter Market) in Nuremberg is packed with vendors selling everything from flowers to jewelry, kitchen wares and food. 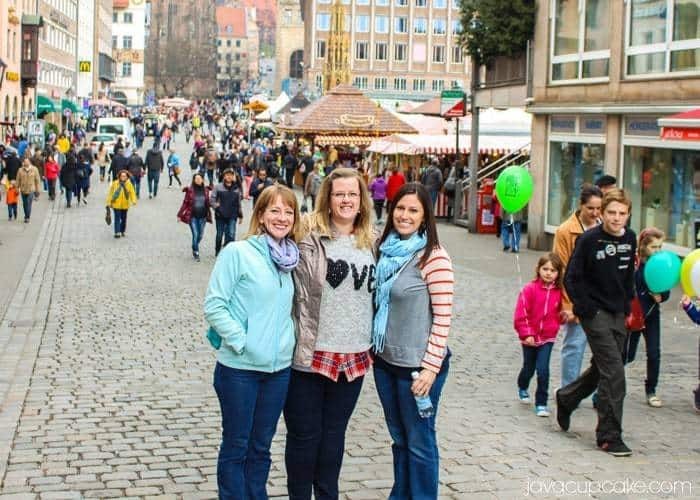 This past weekend, I had the opportunity to meet up with two fellow Army Wife bloggers in Nuremberg for a Bavarian Blogger Meetup! Melissa of Milligfunk (a Healthy Lifestyle, Travel & DIY blog) and Jamie of North of Something (a Family Travel blog) met up with me and my husband, Dave, for a fun day of shopping and exploring at the Nuremberg Ostermarkt. We began at Starbucks for a coffee and snacks where we spent some time chatting and getting to know each other. I really enjoyed being able to share my blogging experiences with other bloggers who really “get it”. 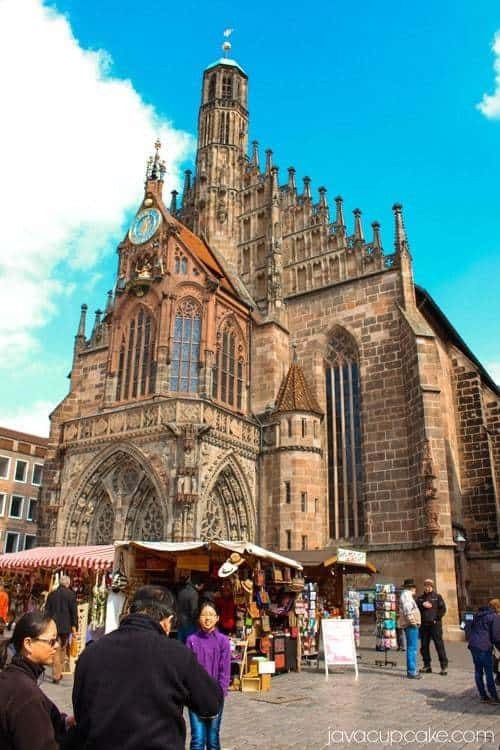 The Nuremberg Easter Market is nestled between a cathedral and restaurants in the heart of the shopping district of the city. Rows upon rows of little stands line the Main Market Square in front of the Frauenkirsche Cathedral. Since I had been to this market several times before, this trip I wanted to focus on all the food and kitchen related stands to share on JavaCupcake. 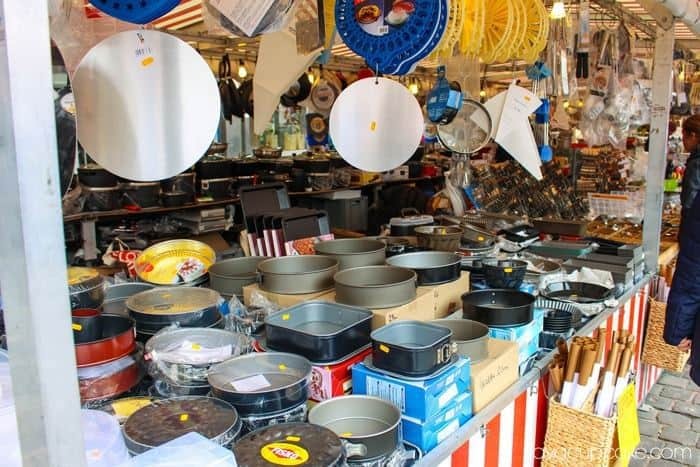 I could have spent many more hours browsing the isles and dreaming about stocking my kitchen with all the fabulous tools, pots and pans and pottery I found in the market. If only I were made of money! My favorite kitchen stand is this one. It’s right on the corner of the first row at the market and I stop her first every time I come. There are at least two other stands just like this one at the market, but for some reason this is my favorite. 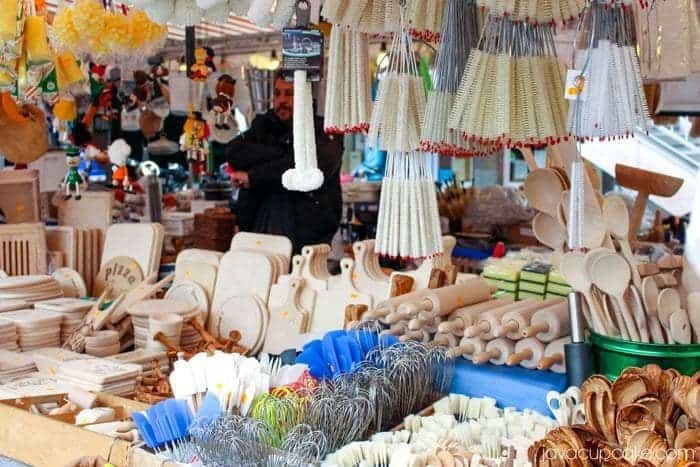 Whisks, cutting boards, bottle cleaners, pizza boards, spoons… and that’s just in this tiny little section of the stand! 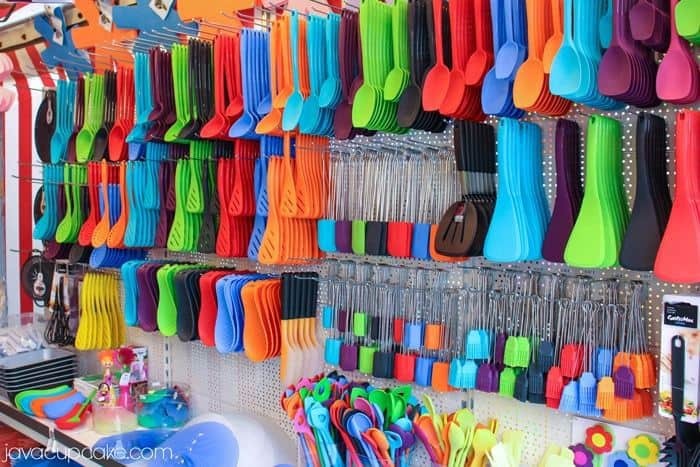 I think I stare at the whisks and pick up every single size each time I visit. I want one of each please! And then there’s the bakeware. 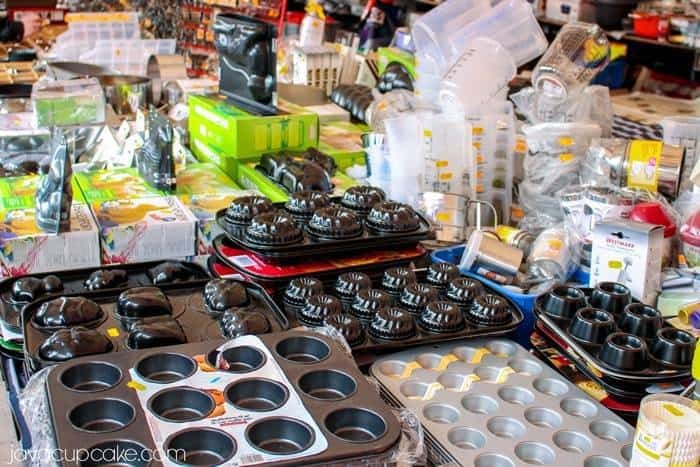 Muffin pans (they don’t really make too many cupcakes in Germany) and mini cake pans… and see that bunny and sheep pan in the back left? 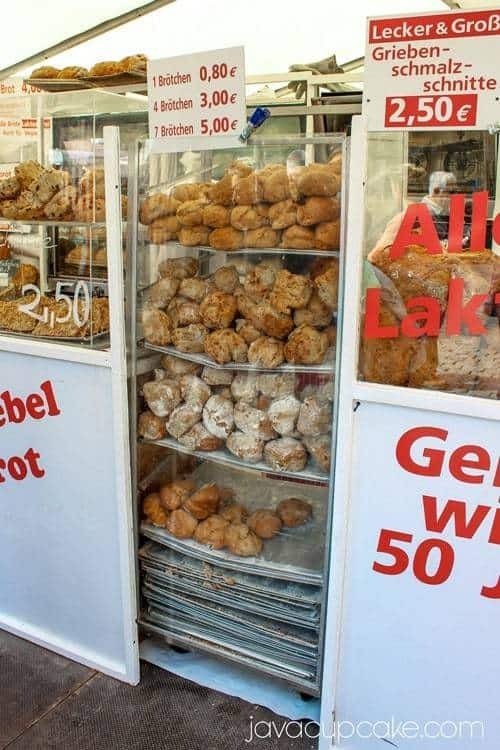 I wish I would have taken a better picture of that, but those are traditional cakes that are made every Easter here in the shape of a bunny or a lamb! I am going to have to buy a pan before I leave Germany! Cookie cutters for days!! I really wish I knew how to flood cookies using royal icing because I would want to make a cookie in every one of these shapes. 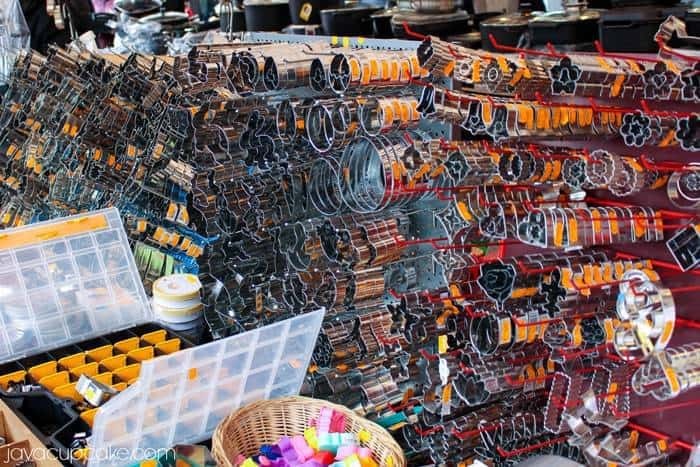 There were probably half a dozen stands with cookie cutter displays with at least this many, if not more to choose from. Some of the stands even had cookie cutters that looked like cathedrals from neighboring cities! 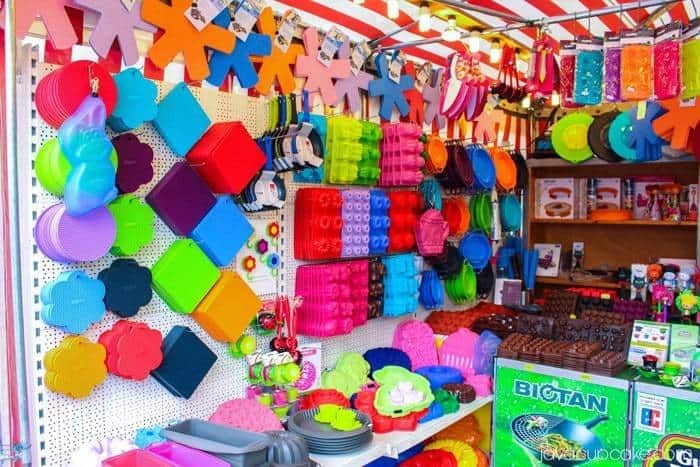 There’s one stand that sells silicone everything. Mats, toppers for your pots, candy molds, cake molds, ice molds. Anything you can imagine that could be made into a mold, they sell it. And then there’s this. Oh. Em. Gee. I like die and go to Heaven every time I come to this stand. The colors alone are enough to bring me joy for days! If I could buy the blue, lime green and orange… one of each in those colors…. well, let’s just say I’d NEVER LEAVE MY KITCHEN. I’d just stand there staring at all the beautiful tools! I mean really, have you ever seen anything like this before? 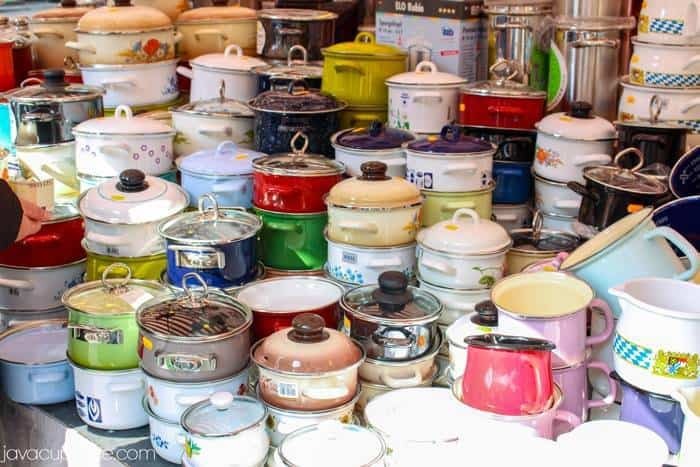 So many pots! And they’re all different! 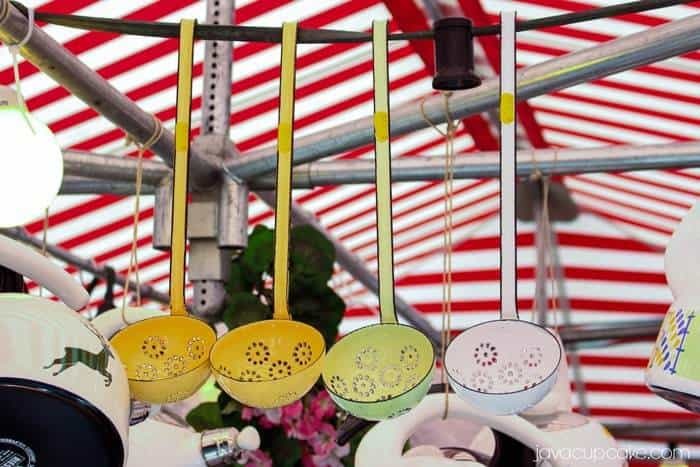 And these ladles. I mean, they have holes in them so it’s not like I could use it for soup… but I mean COME ON! 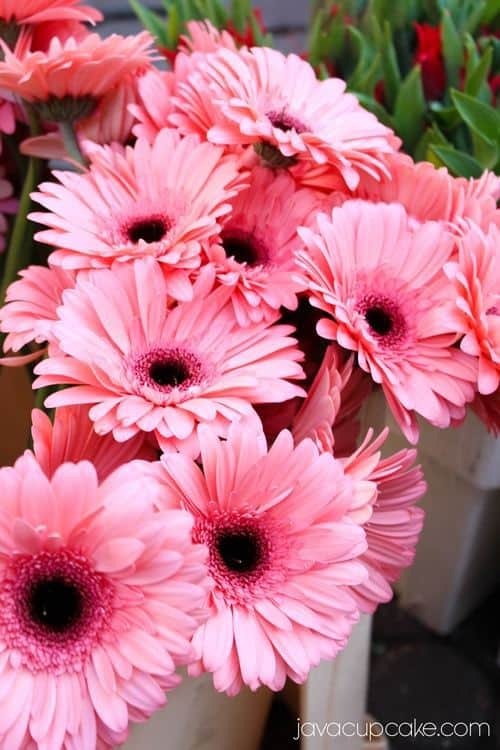 I’d just want to get one in each color to hang on my wall because they are so pretty! 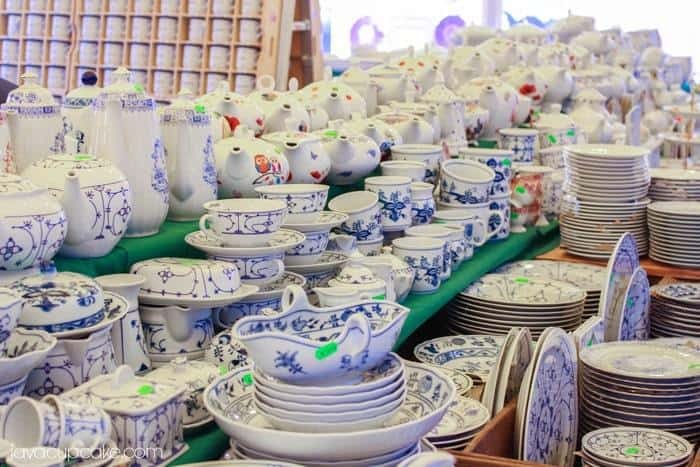 So besides kitchen gadgets and tools… this market is full of dishes, pottery, tea pots and any serving dish, plate or platter imaginable! In the picture above you can just see one small sample of the rows and rows and rows of dishes to choose from. 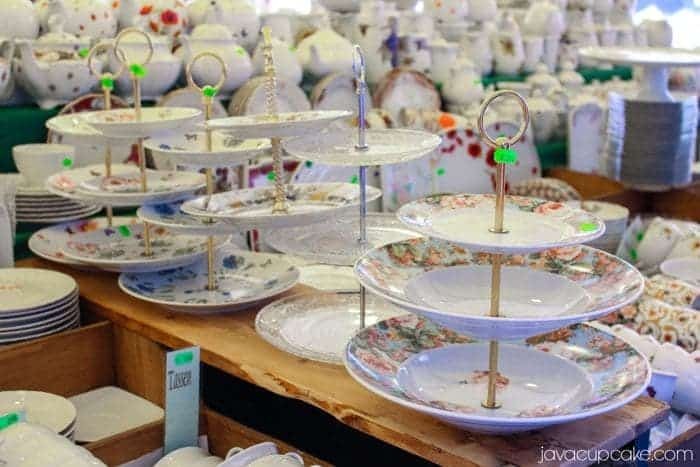 I almost came home with one of these tiered stands too. Unfortunately, I was kidless and strollerless on this trip to the market and had no where to put something this big while I shopped. 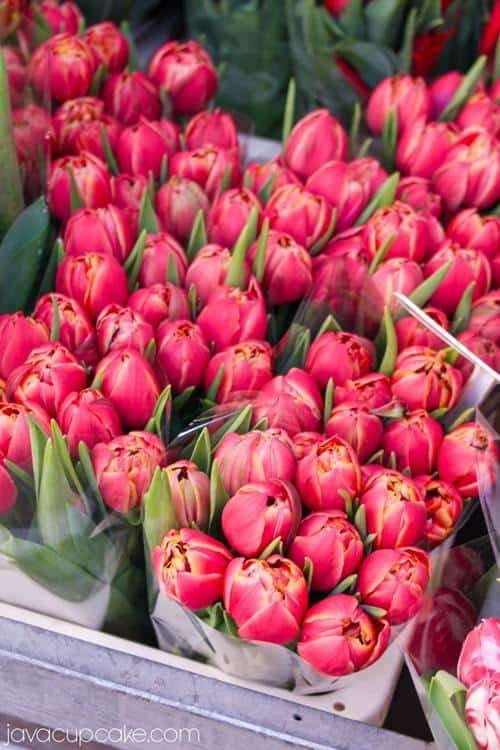 But oh aren’t they pretty!!?? 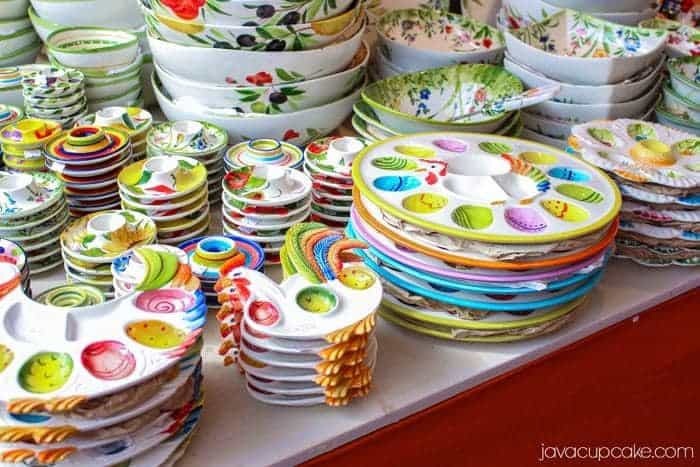 Some of my favorite pieces were the brightly colored Easter egg plates. Wouldn’t one of these be so cute on an Easter brunch table? Can we talk food now? 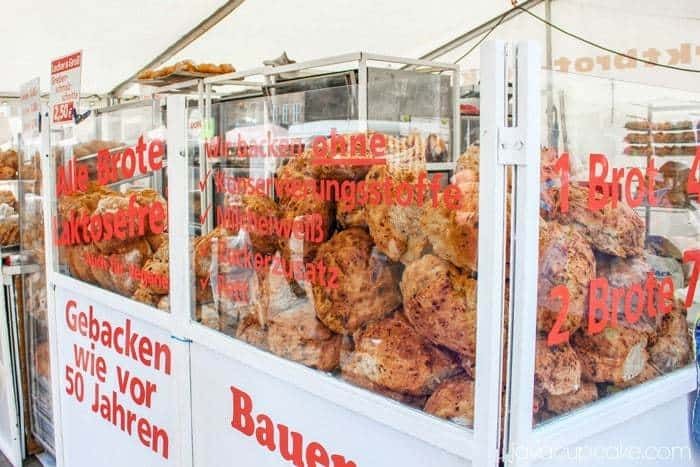 Seriously… there was so much good food at this Easter Market. I could have eaten breakfast, lunch and dinner there… plus a few snacks between! Is is the best bread stand at the market. Behind the front counter they are baking bread fresh all through the day! Piles of freshly baked bread line the windows of the front counter area. They have two choices of bread sizes… big or bigger! This bread isn’t a white bread… it’s a darker, richer, denser bread full of flavor. My favorite is the mini loaves filled with raisins. So good! Every time we come to this market, my husband and I go home with at least €20 in bread! We’d be crazy not to! Behind the counter is a German man who I’m sure has been making bread his entire adult life. 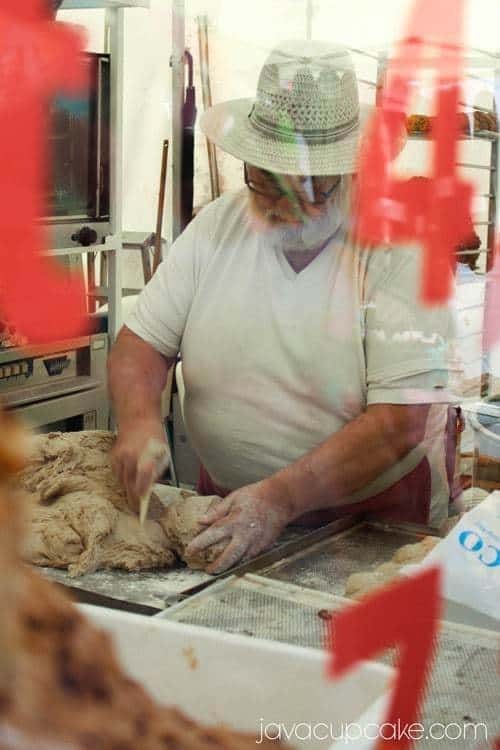 He stands at the same spot most of the day, pulling giant balls of dough out of a tub and hand cutting them into pieces to bake. I probably could have watched him do this for hours. It was fascinating! If you’ve been reading JavaCupcake since I’ve moved to Germany, you may remember me mentioning a few times how much I love potatoes since being here. My snack of choice at any market or fest is always the potatoes. The Nuremberg Easter Market is no exception. There’s nothing new or special about these hard candies. You can buy them at any local grocery store here in Germany. But, there is something about seeing a long row of these big glass jars full of candy with piles of little bags behind them. It’s massive and I get sucked in every time I see it and go home with at least three flavors! 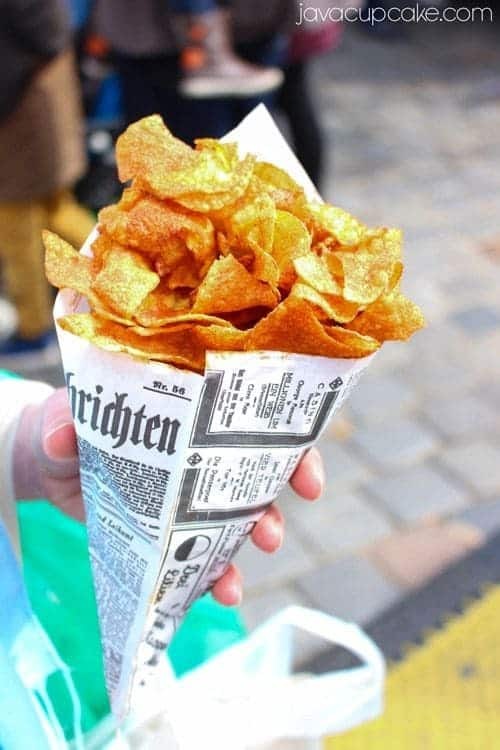 These are freshly fried and seasoned thinly cut potato chips. And yes, they taste as good as they look. Crisp, salty and so addicting! I love these so much, I made my husband take a picture of me with them! Ha! 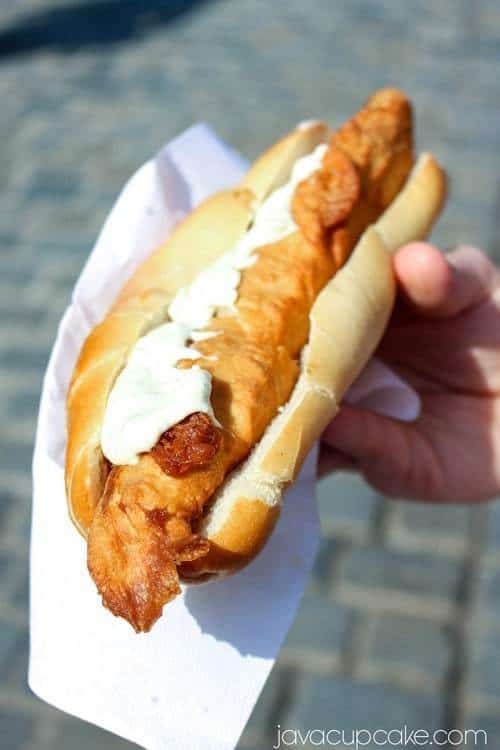 For lunch, Dave had a beer battered fish sandwich… made to order. He said it was probably the best fish sandwich he’d ever had. He had no idea what that white sauce on top was, but he said it was delicious! 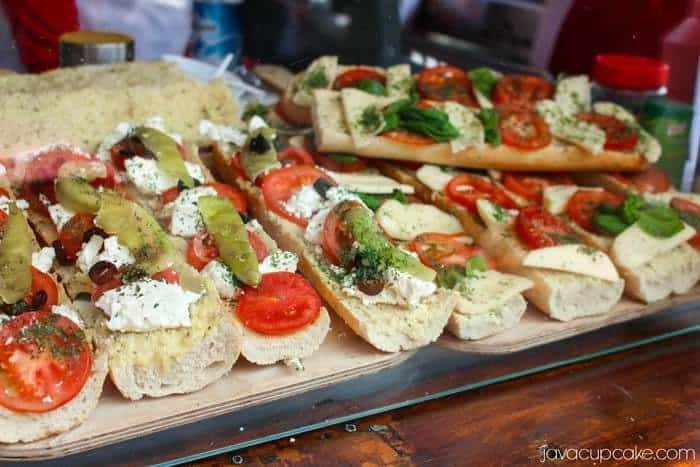 The market also had lots of German favorites like these baguettes topped with cheese and veggies. This type of open-faced baguette topped with things is pretty typical. My favorite are the ones topped with garlic butter and cheese… mmmm yeah. Cheese! Both Jamie and Melissa enjoyed roasted corn on the cob and needed 10 napkins each to clean up the deliciousness! 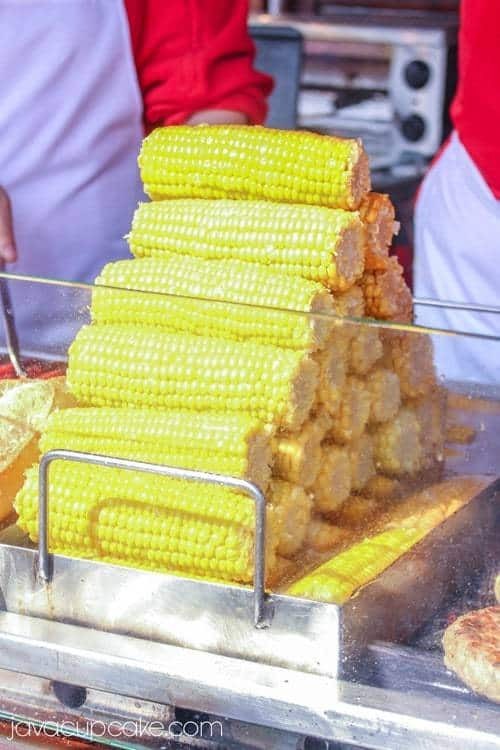 I’ve never seen a mountain of corn before though, have you? 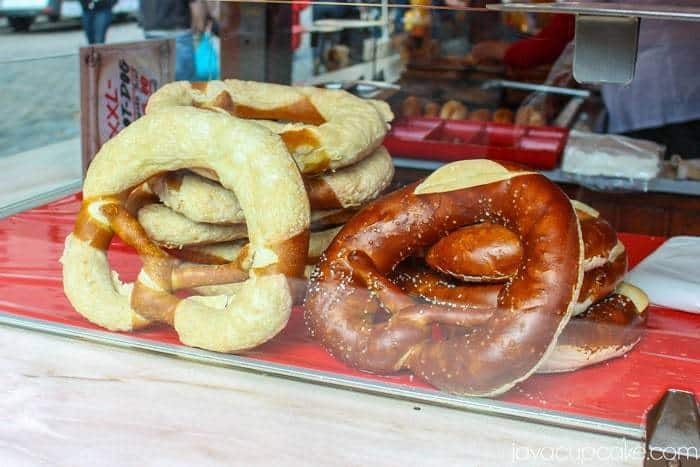 And we can’t forget about the pretzels the size of your head! Oh… and covered in CHEESE! 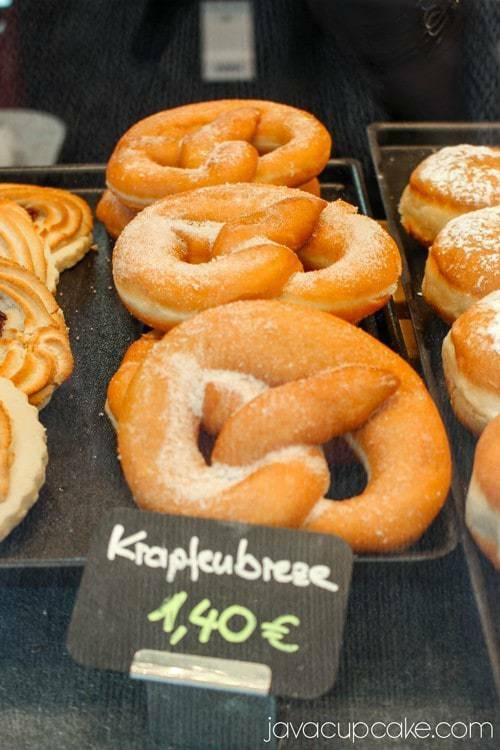 These pretzel shaped donuts were something I’d never seen before. They weren’t at the market, but they were at a little shop that lined the market. I’ve seen pretzels and I’ve seen donuts but not pretzel donuts! YUM! 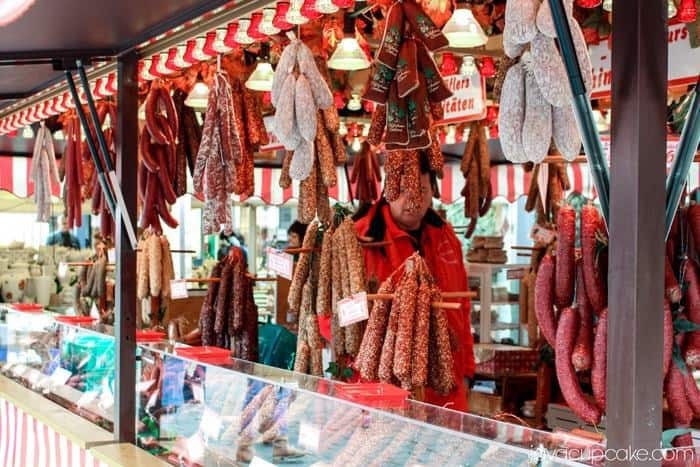 One of my husband’s favorite places to shop at the market is this salami stand! Dozens of flavors of salami freshly made and ready to be taken home! It’s hard to pick just one, but I think Dave decided on the chili salami… the spicier the better for him! 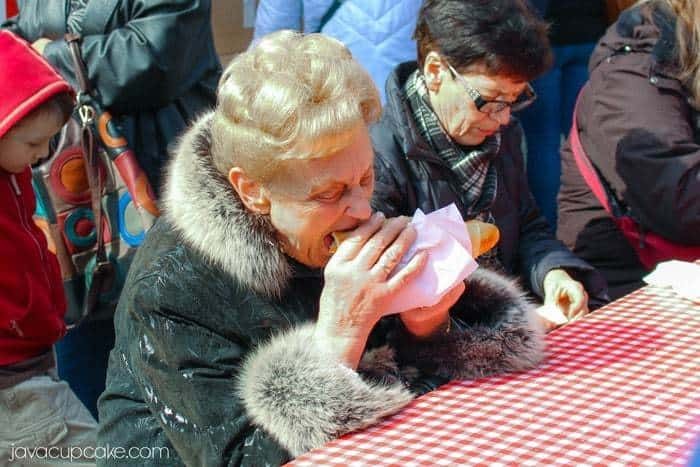 I spotted this sweet little old Germany lady getting down on her fish sandwich. I couldn’t help but want to capture this moment… fur coat and perfect hair and all. This is seriously how the Germans get down when it’s time to eat. Good food, amazing traditions and no apologies. I know these next few pictures aren’t of food… but they are my second favorite part about the market (besides the food!). Spring is my favorite time of the year. The winter chill is making it’s away out and the flowers begin to bloom. I can’t help but be in awe of their beauty. I really had so much fun exploring with Melissa and Jamie! It was a pleasure to meet both of them! 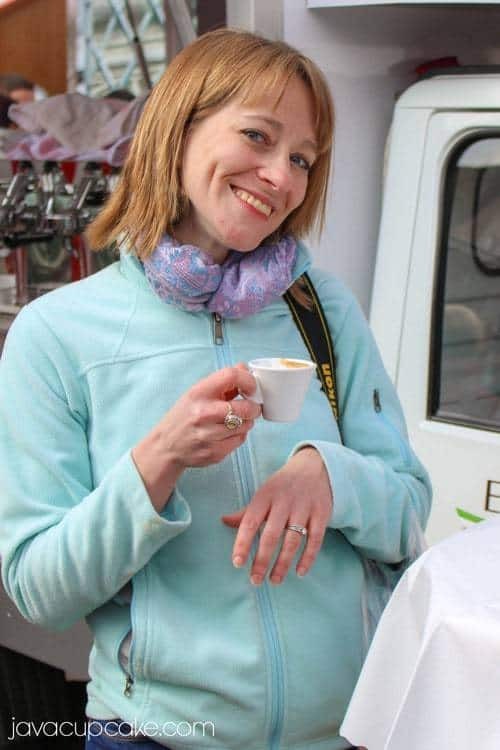 I commented at the end of the day that I don’t know if I would ever agree to meet up with a stranger in the middle of Europe unless it was another blogger! Especially an Army Wife blogger! 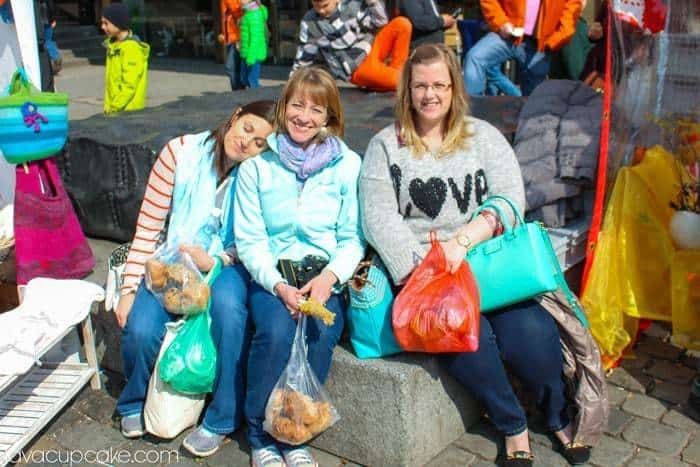 By the end of our fun afternoon, we were all exhausted but happy with our bags full of market goodies! I am really looking forward to chatting more with both these wonderful ladies about Army life, blogging and friendship! 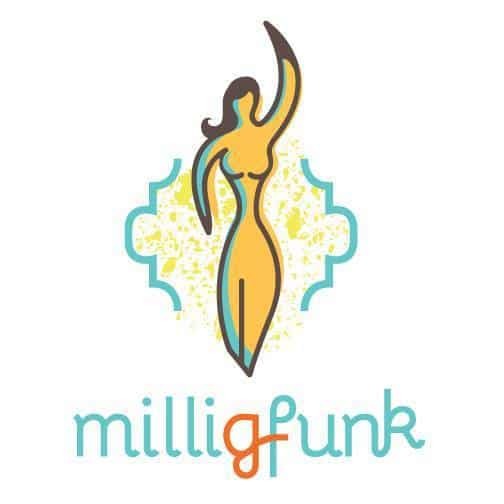 Make sure to head over to Melissa and Jamie’s blogs (links below!) 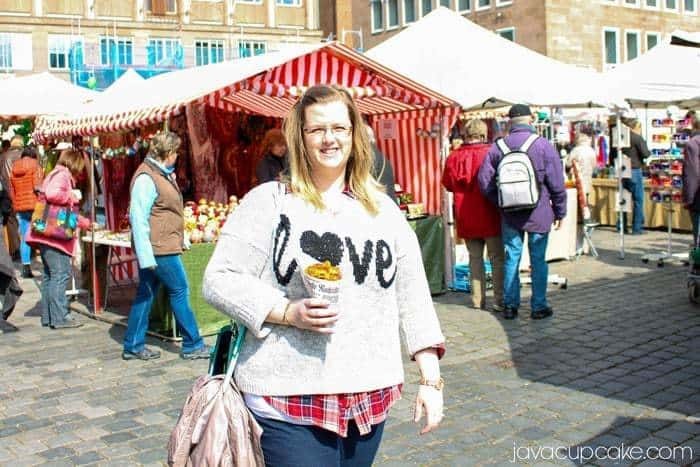 to read their take on the Nuremberg Easter Market and our meet up! I may or may not have a photo like that hehe 😉 Just kidding! Great review! I will definitely have to visit this weekend! Such gorgeous photos! Thanks for sharing, I felt like I was there with you. My sister lives in Germany and we spent a day exploring their Christkindlesmarkt in December. AMAZING. 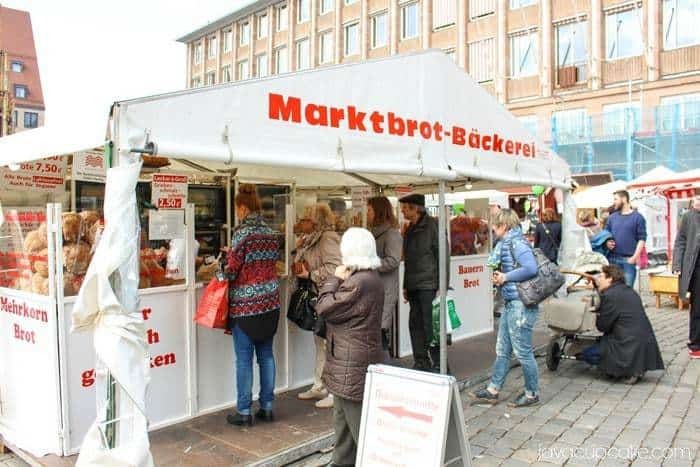 I didn’t know they had an Easter Market, I need to go back now in the Spring! !! how beautiful, FUN, and delicious!!! so jealous! You’re right on all three, Kayle!!! Wish you could have joined us! 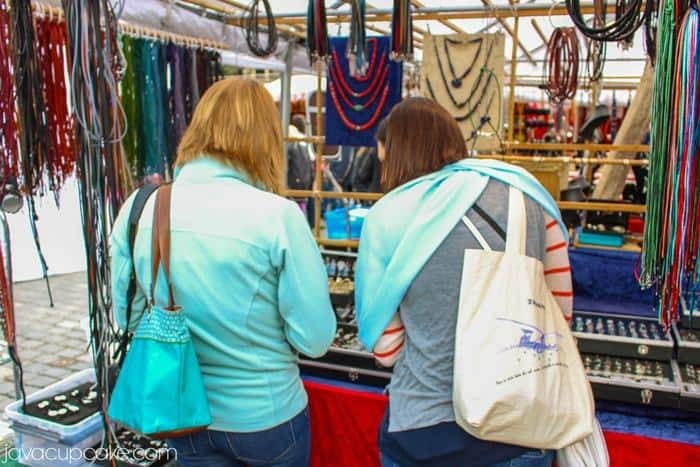 I was just trying to decide whether or not to head to this market tomorrow. After seeing your photos, now I have to go! Thanks for sharing! You MUST! 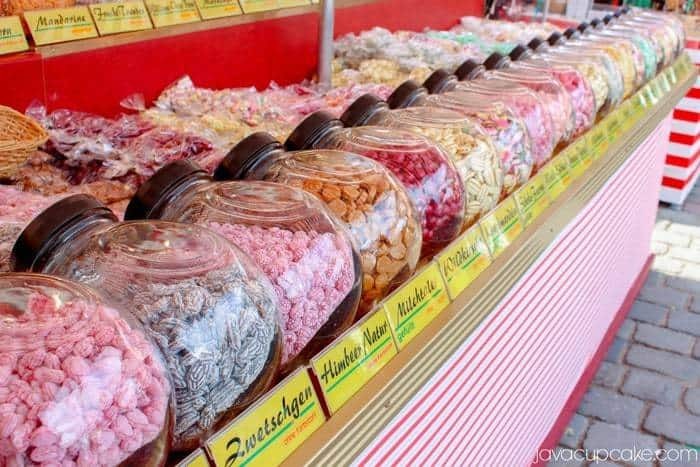 It’s one of my favorite things about Spring in Bavaria! I miss it so much!! !